Are Granite Countertops the Perfect Solution for Your Bathroom? Having the perfect color of granite countertop in your kitchen is essential when you have a specific type of décor in mind. There are so many different colors that you can pick from, so sometimes it can be a difficult choice. Having an idea if you would prefer to go with a lighter hue or a darker one can be beneficial when it comes time to go shopping for a granite countertop will work, so if you are not able to pick a specific color, try starting with that. Once you have the light or dark part of the idea figured out, the rest of the decisions become a bit easier. Going with a light granite countertop is going to give your kitchen the illusion of being bigger with more natural lighting, as it will pick up the light you have in the room. This can be a great benefit when you have a smaller kitchen space to work with. It can also bring a sense of home into a room that is otherwise very impersonal. A light colored granite countertop will also pop if you happened to have light colored floors or cabinets. Going with light colors is also apt to look cleaner longer, since you are not going to have to deal with little bits of dust standing out in the same way it would on a dark surface. Light neutral colored granite countertops typically allow people to feel like they are at the beach on vacation instead of grinding out the day-to-day doldrums in the kitchen. If you want to have the feeling that you are relaxing in a beach house, this can give you the mental escape that may be harder to find in real life. You simply want to make sure that you either figure out a light colored granite countertop that is complimented by the décor you already have in your kitchen, or you pick out décor after the countertop that is going to help your granite stand out in a room full of straight lines. When you want a classic look for your kitchen, then you want to go for a darker colored granite countertop with cabinetry that is a slightly lighter shade. It has been something that looks classy for generations, and it will continue to do that well into the future. Dark granite countertops bring a sense of elegance into the room that is hard to match with other dark features in the room. You do not have to simply go with dark brown or black, either. You can pick other dark colors, such as red, green, or navy blue. The only problem most people face when trying a dark granite countertop is that it can make a small space feel much smaller. You need a larger room that offers significant amounts of natural light in order to counter the effect that a darker granite countertop may supply. If you go with a rich color that is matched by the richness in the flooring you have in the room, you can also counter the darkness in the room by having very light cabinetry. If you are sure that you want to go with a granite countertop in your kitchen, but simply cannot decide which hue you would prefer, go with a little of both. You can have light granite countertops on your island or breakfast bar, and have dark granite countertops in the rest of your kitchen to give people the benefit of seeing both. It brings dimension to your room, and breaks up the monotony that you would otherwise have with a single color taking up the room. Get the look you have always wanted by opting to bring granite countertops into your kitchen. They add a level of elegance, value, and depth to a room that is hard to match with any other material. You can customize the look you want by picking the perfect color for the effect you want. 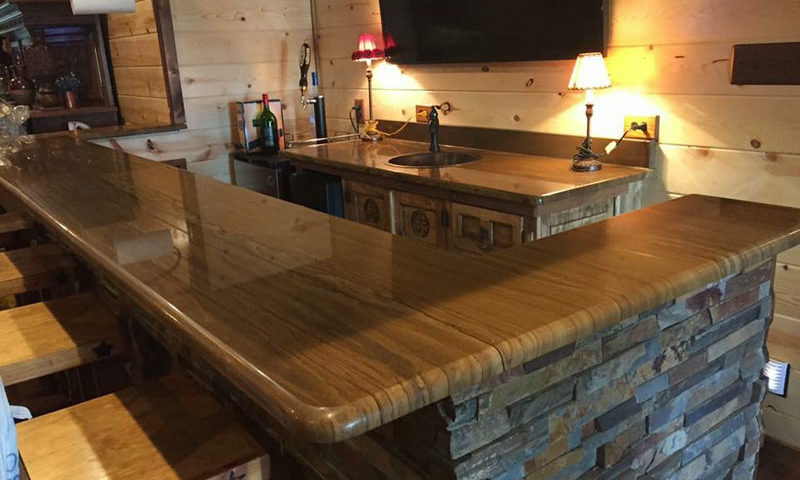 You simply need to make sure you choose a reputable dealer and installer to get the best quality granite countertop for the price, that is sure to be durable and maintainable from the day it enters your home. When you need help finding the perfect granite countertops for your kitchen, look no further than the experts at Granite Huggers. They know how to help you get the look you want with the quality of granite countertop that you deserve. Call them at (972) 670-4533, and have one of their experienced sales people help you pick out the ideal granite countertop to give you the kitchen you want and deserve.